You and your kitchen worked overtime during the holiday season and you both deserve a treat, don’t you think? When you weren’t slaving over the hot stove, you were lining up dozens of cookies along the countertop to cool, to make room for the next batch. In those brief moments when you got a minute to survey your domain, perhaps you realized it was time for a few tweaks here and there. How many tweaks do you think are necessary to get your kitchen spiffed up and looking trendy and into a more modern style? If your kitchen is a mishmash of old and new appliances, furniture and accessories, maybe now is the time to get into a more-streamlined and modern look. Maybe you are already striving for the modern and minimalist look and just want to enhance your existing kitchen with a tweak here and there. 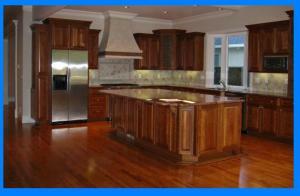 Modern kitchens are known for their functionality or practicality. Think “less is more” and make that your motto. So, likely as to any renovation ideas rattling around in your brain, you probably picked them up noodling around home improvement sites on the internet or at a home show. Unfortunately, those models often don’t fit your kitchen to a “T”, so, rather than re-inventing the wheel if you’re looking to have a more modern-style kitchen, why not just do some embellishing here and there to fresh up the kitchen? Here are a few ideas, starting from simple tweaks to more-advanced, and maybe not so much the typical DIY projects. Even the projects that seem simple in a magazine, might be better handled by a professional kitchen renovation specialist in Atherton. A modern kitchen features less details, and as streamlined a look as possible. If you want to update your kitchen to a more modern one without the need to purchase all new cabinets or invest in pull-out larder units for storage, simply measure all the cabinet handles and hinges then head off to the hardware store to buy new ones in gleaming silver. It is an inexpensive way to embrace the modern and minimalist look and update your kitchen without requiring a ton of effort on your part. In a modern kitchen, chances are you probably already favor appliances in stainless steel, so some silver-toned accessories will look just perfect. If you are trying to inject a warmer look to the minimalist room, try getting all burnished-look handles and hinges. The burnished look will provide a nice ambiance to the room, and is quite easy to match finishes to any new light fixtures you might be installing in conjunction with your renovation. A modern-style home, especially in the kitchen area, might feature a more neutral-toned look, than a cozy atmosphere. The color theme might be neutral for the walls with a hint of color here and there to perk up the place. Splash backs are the perfect look to add a bit of pizzazz to your kitchen. Not only will they lend interest to the room, they require minimal effort and are fairly inexpensive, unless you go with a complicated tile design. They are perfect for the beginning DIYer because most tiles come in a peel-and-stick variety. It doesn’t get any easier than that. The tile colors and styles are seemingly endless and you will have no trouble harmonizing any type of tile to the rest of your minimalist-looking kitchen. Splash backs are the answer to greasy splats behind the stove from bubbling pots of spicy tomato sauce treats or that continued splash of water that threatens to mar the wall and create mold or mildew behind the kitchen sink. Your minimalist-look kitchen, is functional with its lighting just like everything else – efficient, just like you are. But, even the most modern and streamlined kitchen can always use a touch of color here and there. Even better than splashes of color is the placement of lighting in the room to enhance and accentuate your kitchen. Ambient lighting, unlike task lighting which enables you to see better for the task at hand, will unleash a totally new look for your kitchen just with the introduction of new fixtures. Floor to ceiling shelving units help you pack in pantry supplies galore while keeping the true minimalist look. A true modern kitchen features pull-out larder units, deep pockets of storage space that seemingly disappear into huge storage units. There are also floating shelves that keep it simple and help you stack your cookbooks to your heart’s content. And, if you really need extra storage space, why not consider the ultimate in decadent kitchen trappings for the modern kitchen – the island? The trendiest item in recent years for the kitchen is the island. Its benefits have no bounds, from extra countertop space for meal preparation and clean-up, to the addition of storage space. If you’re just a budding cook and have not accumulated a wealth of kitchen accoutrements, your island will encourage you to load it full with gourmet cookware and appliances, plus every gizmo and gadget a foodie could ever want. Depending on the size of your kitchen, you can add an island that will function as a handy place for the family to break bread together or grab a quick meal on the go. You rarely get the opportunity to visit other people’s kitchens when you visit their homes, since most entertaining is done in the living room, sunroom or in the outside living area, especially in a sunny and warm climate like California. But one of the modern kitchen’s most popular traits is the solid wood all around combined with stainless steel elements. You can have that look with substantial renovation, or just a tweak here and there as mentioned above to get the trendy modern kitchen that will be enviable to all who cross your threshold.